As you know, we have been homeschooling (roadschooling, actually) our kids over the last 4 years. This has made it possible for us to travel and minister together as a missional family. Boarding school for our kids was not an option, for personal and financial reasons. So they came along with us and involved themselves in all our projects overseas. And we have absolutely NO REGRETS about our decision to homeschool. The kids are all happy we did it also. Although sometimes its hard to produce the proper paperwork for universities. In our case, we were thinking we would be back in USA but are now actually based in New Zealand, where Abigail is attempting to enter the Polytech College called Whitireia. Yesterday I was on the phone with a teacher at the Polytech who wanted a bit more substantial proof that our Abigail, now 17 and applying for entry, had not been sitting on a couch watching episodes of South Park for the last few years of her schooling. So I sent her something . . . 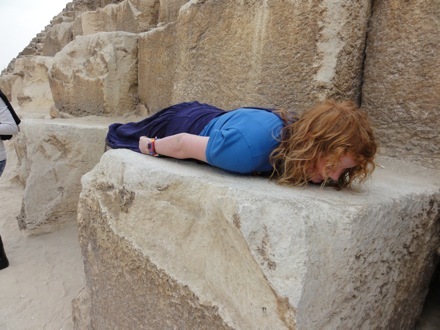 This is Abi “planking” on the Giza pyramids in Egypt. No, I didn’t mention Abi’s various planking episodes in my email. But I did mention some other things . .. In the past 4 years, Abigail has visited many countries in which she took advantage of learning opportunities, cultural immersion, language training, historical studies, etc. She learned from experts in the countries and from daily schooling activities as well as completing directed projects assigned to her by her parents. – Abigail studied ancient Chinese history at the Forbidden City and Temple of Heaven in Beijing, China. – Abigail studied history and archeology in Turkey at the ruins of Ephesus and Pergamum as well as the ancient cities of Troy and Olympos. While there she read Turkish literature (Portrait of a Turkish Family, Birds Without Wings, etc) as well as ancient Greek mythology. – She studied pottery making in Safi, Morocco and spent time with Saharawis (a nomadic tribe) in the Sahara Desert. – She studied war history at Gallipoli, Turkey, in particular the New Zealand impact as part of the ANZAC offensive. – She studied historical religious locations including educational visits through the Pura Besakih Temple (Hindu) in Indonesia, the Blue Mosque (Muslim), and the Hagia Sofia in Istanbul. – She studied East/West European reunification at the Berlin Wall, Germany and took a Jewish history tour of Budapest, Hungary (she had already visited Auschwitz-Dachau Nazi camp in Poland as a child). – Abigail has studied nutrition and is familiar with vegetarian, vegan and raw food diets. In 2010 she climbed the Atlas mountains in North Africa with her baggage on a donkey to attend a Rainbow Festival. – In Lisbon, she studied the impact of Portugal on the world through maritime exploration. Her text book was “The Worlds First Global Village”. – She has gained agricultural experience in shearing sheep, handling pigs, milking cows, as well as from gardening projects in New Zealand and olive harvesting in Portugal. – Abigail went to Transylvania, Romania to research the prevalence of bats and the myth of Vlad the Impaler and Count Dracula. – She studied ancient Egyptian history at the museum at Cairo and on location at the Giza pyramids under the tutelage of Ibrahim Morgan, historian and Egyptologist. Of special interest was King Tut, who was about the same age as Abigail and, like Abigail, had ear plugs. – At Lake Ohrid, Macedonia, Abigail researched the ancient cave churches and the early monasticism that produced the Cyrillic alphabet. – She studied the art and scientific inventions of Leonardi Di Vinci at Venice, Italy. 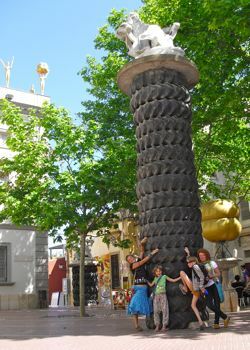 – In Spain, Abigail studied the surrealist art of Salvador Dali at the Dali Theatre-Museum in Figures, and the works of Pablo Picasso in Barcelona. – She studied the architectural achievements of Antoni Gaudi in Barcelona, Spain, in particular the Sagrada Familia. – She gained experience in bookkeeping, accounting and budgeting both at the hostels and with social enterprise projects. – She has learned the crafts of pottery, sewing, knitting, spinning wool, crochet, and clothing modification. She also learned the art of piercing and tattooing from Portugal’s first and leading tattoo artist, Paulo Matos. – She studied alternative building methods through participating in the construction of straw-bale houses, geodesic domes, yurts and helping to construct a self-build motorhome from an empty truck shell. Abigail has just turned 17 years old and has become a capable, reliable, hard-working, young adult. She has now been to over 40 countries and gets on fabulously with people from any culture. We are very proud of her and expect her to excel in whatever she puts her mind to. Abigail has suffered from Type 1 Diabetes since the age of 7 but that has not stopped her adventurous spirit or her nomadic exploits. She always wanted to sky-dive, a desire that was fulfilled last year when she jumped out of a plane in Queenstown. I call her the world’s most adventurous diabetic. I understand her education has not been normal, at least for the past 4 years, but we believe it was exceptional and productive and has helped shape Abigail into the spectacular and individual person she is today. I will be happy to send more information if needed. Wow, fantastic. Well done Abigail and well done Joneses! When homeschooling is done well it is awesome. Well done ma and pa too for providing such a rich education for your children. Not digging at anyone – not even the educational system. sorry if it sounds to you like i am being critical because that was not my intention. hey guess what???? a few minutes ago, an email arrived which said Abigail was ACCEPTED for her program which starts next year . . . . . YYYEEEEAAAAHHHHHH!!!!!! Yes Abbi is one Amazing “and Emerging” young women of faith,paving a new path…thanks Mom and Dad for your faith journeys! yeah she is. and she did very well at the interview for this course also. i just heard that out of a very large group of applicants, only 16 students are accepted each year and only 8 are subsidised by the government. Abigail was accepted as one of those 8 students accepted. well done, Abi! I evaluated Whitireia Polytechnic in 2010 for NZQA. Was highly impressed. What course she doing? she is doing the beauty and hairdressing course. Yeah Abigail! Yay Tall Skinny Kiwi family. HOmeschooling rocks! Nothing can be better than studying history and archeology in Turkey at the ruins of Ephesus.